Can we help it if every chef in town wants to shower us with truffles? Yeah, it’s tough around the ELV offices in November, when these little tubers hit Vegas’ best restaurants like a blizzard of fungi….leading to a rain of them on just about every savory plate. This year has been a good one (i.e. a prolific one) for tuber magnatum in northern Italy, so the price has been down and the ‘shrooms aplenty wherever we go…leading us to evaluate each one with the precision of an Olympic skating judge. So far, the one’s we had at Circo last Friday were the most intense, with these in close second place. Guy Savoy’s big boy was a beaut…but lacked that certain je ne sais quoi, or overall knock-your-socks-off quality that comes from the smaller ones. Bartolotta’s was the mildest…but that’s most befitting its use on seafood dishes. Perhaps, this year we’re putting too fine a point on these things, but, ELV being ELV, we can’t help ourselves. As for the rest of our unexpected meal at Valentino (we just stopped in to pay a quick visit to www.egullet.org’s David Ross), it was as extraordinary as usual. While we concentrated on the food (and the wine and the grappa with Luciano Pellegrini), David and The Food Gal® concentrated on Piero Selvaggio’s extraordinary story telling. If you’ve never had the chance, listening to Piero talk about restaurants, wine, Italy, his journey to America, and just about any other tale he has to tell, is one of the great experiences in American gastronomy. He describes himself (along with Wolfgang Puck and Sirio Maccioni) as the first and last of the old guard — those restaurateurs who took America by the hand in the ‘7o’s and early ‘8o’s and taught it what world class restaurants could be. People tend to forget, but for over twenty years, Valentino in Santa Monica was considered the best Italian restaurant in the country…and it’s still in the top 5. Selvaggio can also be credited with, almost single-handedly, starting the Italian wine renaissance on this side of the pond. His cellar at his flagship is legendary…and worth a trip to SoCal all by itself. (Helpful hint: call ahead if you’d like a tour, and avoid peak times — after a late lunch is best). We plan on hitting Santa Monica soon to try Nico Chessa’s new menu, but in the meantime, we’ll settle for Pellegrini’s perfect risotto (or God’s porridge as he calls it). An old Italian (the same paisan who described the perfect panna cotta as feeling like a woman’s breast) once told us that, in a perfect risotto, you should be able to count the number of grains of rice in your mouth. This statement, however useful*, doesn’t account for the regional variations of risotto throughout Italy, where some cooks make it soupier than others. But if you’re going to use that description as a risotto yardstick, there’s no denying the impeccability of Pellegrini’s. Nor of all those white truffles. Whatever check there was was picked up by Mr. Ross, and Mr. Pellegrini, and Mr. Selvaggio. Grazie mille! * ELV has always found the panna cotta description especially useful, especially when there is an attractively-breasted woman at the table. So… all patrons get Selvaggio to come pick their wines for them? Or was this special treatment? Hmm. Oh, look, it was free. Can’t be a biased whatsoever. Oh, please. This wasn’t the first time Mr. ELV has been to Valentino. This is just getting petty now. -Mr. Selvaggio, Chef Pelligrini and the staff would be more than happy to choose your wines should you be seeking advice on what to pair with your particular dishes. -ELV and the lovely Food Gal were invited guests. As such, as their host, it would have been gauche to ask them to pay. This was not a “free ride” as you assume. (And it was a pleasure to have a spirited conversation at the table with people who are passionate about Italian cuisine–and well worth every dollar). ahh, to actually have the chef cook for you. 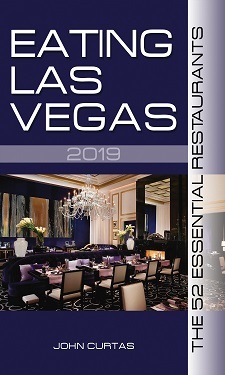 What was that book called by Marcel Proust?……… This place used to be the greatest restaurant in Vegas. Looks like there is still some magic left in that hat Frosty.